Many patients who anxiously see their physicians with progressive swelling over the wrist are concerned about cancer. They are relieved but perplexed to have the diagnosis of Ganglion made. This is a benign but annoying condition that can cause significant pain and disability. 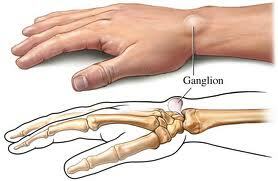 A ganglion is merely an out pouching from the capsule of the wrist. The capsule is the tough ligamentous tissue which holds the wrist bones to the forearm. If there is a hole or a weak spot in the capsule the underlying tissue can bulge out much like the old inner tubes could bulge out on a car tire. Most ganglions are small and do not cause pain, but some can get fairly large. If the ganglion impinges on any of the tiny nerves in the wrist capsule it causes pain and disability. The treatment of a wrist ganglion is basically a numbers game. In the old days professional and amateurs would smash the ganglion with a heavy book (the Bible Treatment). This is an effective way to eliminate the out pouching and many patients today will report that his ganglion disappeared after he accidentally smashed his wrist. Unfortunately most ganglions (about 80%) will recur with this treatment. When they do recur they are bigger and more painful. The second method of treatment is aspiration of the ganglion and injection with steroid medicine. Steroids are an anti-inflammatory medicine that causes the ganglion to collapse. This method is successful about 50% of the time. Occasionally the medicine can cause a steroid flare with intense pain for about 12 hours. The final method of treatment since it is successful 90% of the time and can be done as a minor out-patient surgery. Unlike the previous two treatments the recurrence rate is low – less than 10%. Most of them that recur are small and may even represent an out-pouching from a different spot on the capsule.